Did everyone watch the Giants get trounced by the Eagles on Sunday night? I actually mostly didn’t, choosing instead to watch Divergent with my lady. Divergent was pretty good and entertaining, featuring solid individual performances and an enthralling story… the exact opposite of the Giants game. The Giants had a real chance to put their stamp on the division in this game, but blew it instead. I’ll keep this one brief, because I don’t really want to relive the 27-0 beatdown the G-Men received in Philly. The Giants’ offense was awful. Nobody played well. The offensive line, which had been oh so good over the three-game winning streak, couldn’t stop anyone. No one on the Giants had a positive Pro Football Focus grade, which is the best way to judge an offensive line, apparently. All of that ineptitude led to 6 sacks of Eli Manning, who didn’t stand a chance all night long. The Eagles even sacked Ryan Nassib twice for good measure. Admirably, Eli didn’t throw any interceptions for the third straight week, but he was on the ground all day and only managed the following stat line: 13-23, 151 yards and 0 TDs. Tough one out there, Eli. At least the O-Line wasn’t biased, blocking equally poorly for Andre Williams and the running game. The Giants only managed 85 yards on 23 carries on the evening. 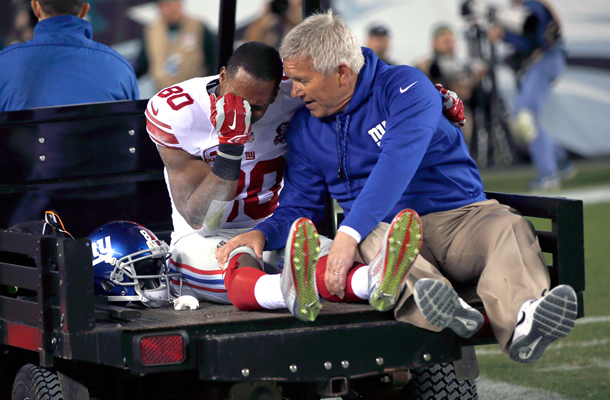 The worst of the worst came in the third quarter, when Eli threw a ball to Victor Cruz on in the End Zone on fourth down. The Giants most talented receiver tried to go up for the TD catch, but crumpled immediately to the ground in agonizing pain. Tears streamed down his face as he was carted off the field, and everyone knew his season was over. A bit later, the official diagnosis, a torn patella tendon, came down from the booth, but it didn’t matter. We’ll miss you Victor. Here’s hoping guys like Odell Beckham, Rueben Randle and Preston Parker can step up and help out. Do we need to talk about the defense? The game ended 27-0. The Giants couldn’t stop the run, as LeSean McCoy finally decided to have a good game (of course). Nick Foles threw a couple of picks, but generally had a decent game, not that it mattered. The Field Goal the Eagles got on their opening drive ended up being enough for the win. I’m not looking forward to next week’s tilt against the Cowboys. Are you?